Gift of Ann M. Weygandt, granddaughter of Cornelius Nolen Weygandt. Seven additional diaries and memorandum books, dating from 1848 to 1862, were purchased in 2004 to complete the collection. The diaries of Cornelius Nolen Weygandt are chronologically arranged. Correspondence, ephemera, memoranda, and clippings, which were originally kept folded within the pages of the diaries, are now kept in separate file folders which follow their respective diaries. Cornelius Nolen Weygandt was born in Philadelphia in 1832, the son of Thomas Jefferson Weygandt and Sophie Makins Helmbold Weygandt. He attended Central High School in Philadelphia and graduated in 1848. He continued his studies independently, focusing his attention on the classics, and pursued these interests throughout his life. In addition to reading the classics, Cornelius N. Weygandt was actively interested in art, theater, history, and genealogy. Weygandt went directly from Central High School to his career in banking. He began as a clerk at the Western Bank, located on the south side of Chestnut Street just west of Fourth Street, in the heart of Philadelphia’s nineteenth-century financial district. The Western Bank was chartered by the state in 1832 and by 1861 had a capital of $500,000. In 1863 Weygandt was appointed Cashier, a position roughly equivalent to chief financial officer in a modern corporation. On February 3, 1865, the Western Bank was chartered as the Western National Bank under the National Bank Act. In 1878 he was elected Vice President of the bank, and in 1887, he succeded John Patterson as President. Weygandt served as president for twenty years, until his death in 1907 at age seventy-five. Weygandt married Lucy Elmaker Thomas. Their children included Lucy Weygandt, Sophie Weygandt, and Cornelius Weygandt (1871-1957). On Oct. 3, 1849 Cornelius N. Weygandt wrote: “Last night I formed the resolution of keeping a journal, in which to insert such incidents of my daily life, as I might deem worthy of notice. I have made the same resolution before this time but have been too lazy to carry out my designs. I began a journal about this time last year but soon neglected it, not having kept it more than six months. In this one I hope however to be more successful, and I think that I shall at least be able to finish this book of reminiscences. Time will show the value of my resolutions. …” Cornelius showed resolve for five days making his last entry for 1849 on October 7. He began again in 1852 with shorter entries into small pocket diaries. These diaries give details on the daily routines of his life. This includes information on what time he rose from bed, accounts of weather, books read, family, friends, social visits, his courting of Lucy Thomas, and reports of entertainment such as plays and operas attended. 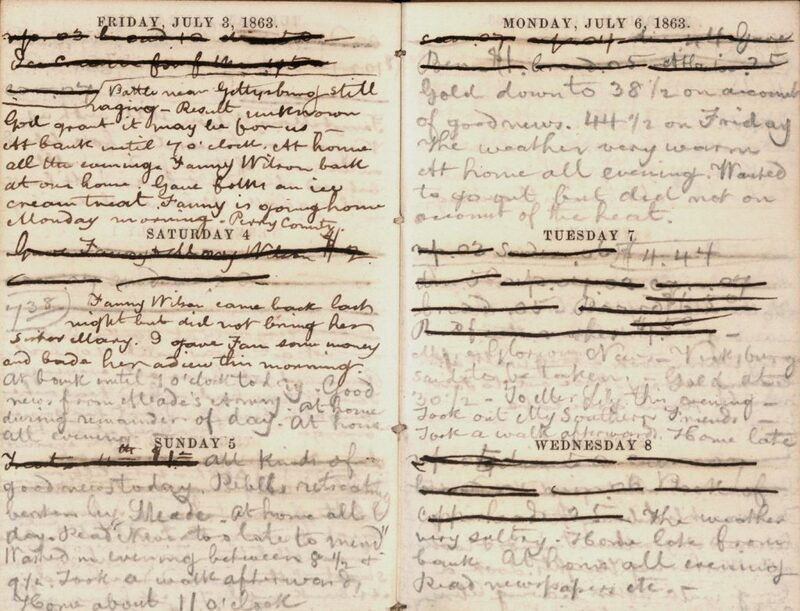 Beginning in 1878, the year Weygandt was appointed Vice President of the bank, his diaries are no longer the small pocket diaries, but larger octavo diaries with lengthier daily entries — more closely aligned to his original efforts of 1849. These diaries contain not only information on the daily routines, entertainments, and books, but also information on investments, banking, economic history, as well as an abundance of social history with commentary of Philadelphia society and local scandal. His diaries continue in this vein for the remainder of his life. Typically Weygandt would collect correspondence, ephemera, and clippings (kept folded within the diaries) which would highlight activities each year. Banking, art, and theater were the main topics of interest, but local politics and sensational news stories also found their way into the creases of the volumes. Additionally there is a small series of letters, 1845-1852, from W.W. Cottingham of Easton to Cornelius Weygandt. Cottingham was a close personal friend of Weygandt who was closely acquainted with Weygandt’s extended family in Easton. His letters cover many topics including Cornelius’ independent pursuit of study in the classics; family life; Cottingham’s student life at Princeton Theological Seminary; his first sermon; his broken engagement to Caroline Deshler of Easton which was a result largely due to rumors that he was paying attention to a certain Sophie Weygandt of Philadelphia; request for books from Cornelius in Philadelphia; and Cottingham’s teaching career. Western National Bank (Philadelphia, Pa.).